I’ve had some schedule rearranging do to a whole lot of things, so I figured I’d give everyone an update. Just One of the Groomsmen releases May 28th. It’s about a girl that’s always been one of the guys. She’s even a groomsman for her friend’s upcoming wedding. 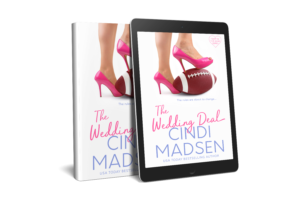 Only now she’s developing feelings for one of the other groomsmen—the one who’s been her best friend for as long as she can remember. 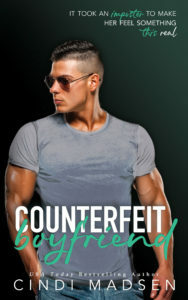 Counterfeit Boyfriend has a new cover and is going to be on sale this week! So if you haven’t picked it up, now’s the perfect time. I also have a new series coming out in mass market paperback. It was pitched as Gilmore Girls meets cowboys and I’m super excited about it! I have another project that I can’t announce yet, but as soon as it’s all finalized I’ll be shouting it from the rooftops. Just know that this next year and 2020 are going to be filled with lots of fun books! Now for the questions I get occasionally through email and on Facebook. Here’s the hard truth. My MMA books didn’t sell as well as my publisher or I hoped. When this happens, other books in the series get cancelled. I’m lucky in that my publisher has worked with me long enough they wanted more books. So we pivoted to a football series. 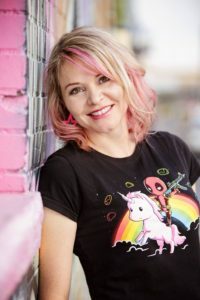 This means that Finn’s book is on hold, possibly indefinitely. Anyway, that’s all the news for now! Know that I appreciate you all! Signed up again, to be sure….oh boy!